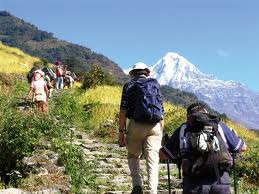 We provide full service tented treks led by highly trained guides with knowledge on Nepalese culture and high altitude survival skills. We take pride in the high quality of service we render - personalized, professional and above all enjoyable. Our crew with a keen sense of hospitality will make your holiday worthwhile. You will make friends with our tour leader during the trip and find adventure that you will re-live for the rest of your life.